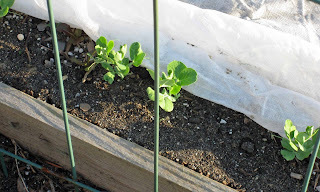 The peas have sprouted in the garden, along with all the other early spring vegetables I sowed back on March 16th. The vegetable garden is right on schedule after one month. Even though the seeds have all sprouted, or especially because the seeds have all sprouted, I'm still keeping the row covers on everything except the onions. There are rabbits out there! The onions are that little sliver of green in the first bed that is covered. Fortunately, rabbits don't like onions, so they are safe to leave in the open. Further back, you can see the new compost tumbler. I've been turning it every few days and tonight I opened it up to see what was going on inside. Composting was going on inside it. It was hot in there, hotter than the open compost piles next to it. Elsewhere in the garden, Mr. Rabbit was enjoying the lovely evening. I think he looks kind of fat, or does the camera just make everyone look heavier? Where has he been eating? What has he been eating? I'd like to live in a state of denial and think that he is eating at the neighbor's and just coming here to May Dreams Gardens to smell the flowers. On the right in that picture you can see that the lilac is leafing out quite nicely. I believe and predict that this is going to be an outstanding year for lilac blooms, as long as we don't have any days like last April when it was cold, below freezing night after night. On the left, barely visible, is a Viburnum which has not leafed out at all. Sometimes as soon as people see one shrub leaf out, they assume any other shrub that hasn't leafed out is dead. Not true! Each shrub 'breaks dormancy' in its own time. If you think a shrub is dead and not dormant, try to bend a branch and if it snaps and is all dry, it's probably dead. If it bends without breaking, it is probably just not ready to leaf out yet. Gardeners have to be patient. We might think spring is all frantic and hurry up, especially when we start to see leaves and lilac buds, but really, a lot of it is slow and steady. I'll remind myself of that as I start running around here at May Dreams Gardens like the proverbial chicken with its head cut off, thinking of everything I want to do right now, suffering from an acute attack of GADS. Hi, I thought you might be interested to know that your April Bloom Day made it to being announced on the blog of Emma Townsend the Gardening journalists on one of the Daily broadsheets in the UK. She writes a regular column for the Independant on Sunday. Carol, looking good! The garden that is. Maybe the fat rabbit is about to give birth?? You wouldn't deny a mother would you? :) I hope you are right about the lilacs. After last year, I am ready for lots of blooms. GADS indeed, Carol. Just take a deep breath and repeat after me...one bed at a time...one bed at a time...just like the shrubs take their own time. And yes, that rabbit looks fat. Make good stew, he would! Those rabbits know a good place when they find it. I am hoping to avoid rabbit trouble this season, but they sure moved in over the winter. Guess I'll have to up our "guard" dog wages to three biscuits a day. About lilac, mine is beautiful, never been such a beauty. So you seem to be right. I think the rabbit is male. I don't see a dewlap under its chin. Does have a dewlap to provide extra fur to line a nest. Of course, I could be wrong and in three weeks you'll have five bunnies admiring the lilacs! I was told by someone recently that if you put plastic snakes in your garden the rabbits dont like them and stay away. They have to be realistic looking snakes, so ones bought from a zoo etc and you need to change their location frequently but it may be worth a go. She also recommended moth balls for inside greenhouses to stop mice! The rabbits know where the best garden to feast is, lol. Seriously, I do wish you luck on your rabbit dilemma. Hope it's not a mother to be! I had an attack of gads yesterday, the day before uh, pretty much all week with the first really nice weather of the year. Hi Carol, You do have a healthy looking bunny in your garden. 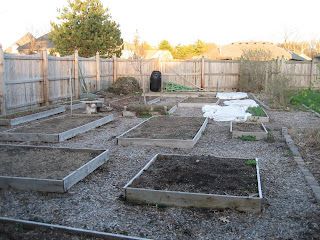 Your veggie garden looks so nice and neat. It is good to have your peas covered. Did the Earthquake awaken you this morning? It was a doozie. I am following your advice and weeding half an hour a day on the nice days when I have no time to garden. I figure I can just go to bed a half hour later and I sleep better knowing I did at least a little something. Another trick to determine if a woody plant is alive: Scrape the bark with a sharp pen knife (or your pruners or fingernails if they are handier). If the wood is green, it's alive. If it's brown or black, it's dead. Yay, edibles! We just sowed some seeds today. We're a bit behind but oh well. I've yet to see rabbits in our neighborhoods. But raccoons run rampant. Looks great Carol. I think the rabit needs to lay off of your fine seedlings or risk gettting a tummy ache. Zoe, Thanks I found that blog and was thrilled to know we had been noticed for bloom day! Beckie, I have had rabbit babies in my garden before, and I just leave them alone. They eventually leave. Don't tell anyone, I have a reputation as to protect! ChrisND, Only pay that guard dog if he is successful, otherwise, he'll be as fat as the rabbits! Verobirdie, I hope I am right about the lilacs! SeasonsSeatingFarm, I hope you are right that it is a male rabbit. PatientGardner, I have heard about putting plastic snakes in the garden. I tried it with sections of old garden hose meant to look like snakes, but the rabbits weren't fooled. I might just try some more realistic looking ones. Karen, GADS is really a good thing, because you do get a lot done just being out in the garden doing a bit here and there. Eventually it all adds up! Lisa at Greenbow, I was awake when I felt the earthquake and it took me a minute to decide that is what it was. It must have really shook you up! Kathy, That makes me feel good, that you are following my advice. Just a half an hour a day can make a difference on any task we are trying to get done. Earth Girl, I've done that too, and almost put that in the post but ran out of time and energy. Thanks for adding it here in the comments. The Gardeness, We see a few raccoons but not so many that I am worried. Now, once my sweet corn is ready to harvest, I'll be worried about them! Curtis, You go try to tell the rabbit that! Thanks all for your comments and helpful advice!